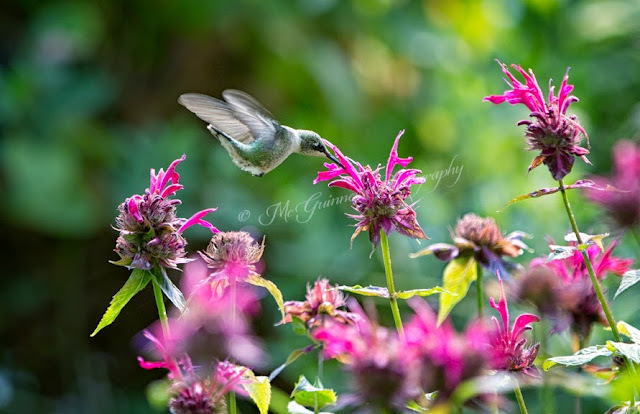 A female ruby-throated hummingbird visits "Raspberry Wine" monarda in this file photo. EAST HAMPTON, Conn. - The trick to luring hummingbirds to your garden is to offer a variety of plants with a continuous bloom cycle. "You can stagger the bloom time so you can offer food all season," said Lynn Saitta, manager of the Paul's & Sandy's, too, Inc., a garden center in East Hampton, Conn. "Mix it up a little bit with annuals and perennials." The majority of plants that attract hummingbirds grow in full sun. A best-selling annual at Paul's & Sandy's is lantana. Once it is established, it will take on hot sunny locations with ease. 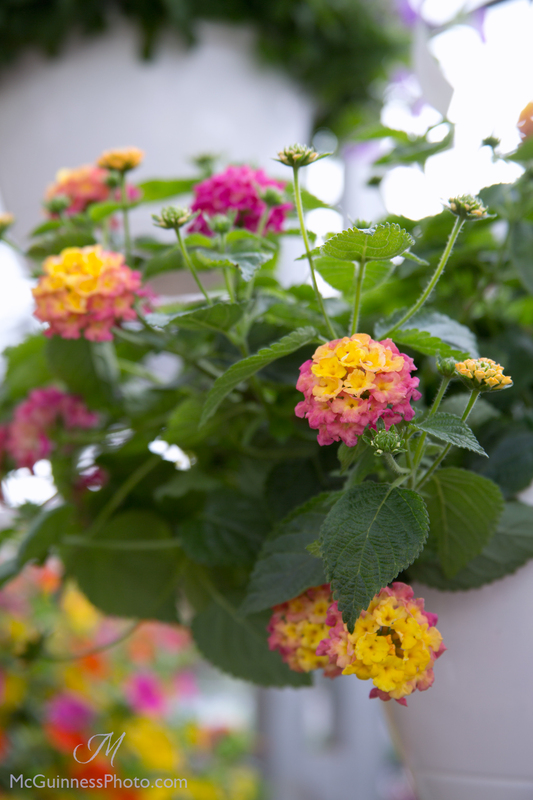 Lantana produces many multi-colored flowers, grows well in containers and also attracts butterflies. It's one of the easiest summer annuals to grow and to keep it blooming, deadhead regularly. 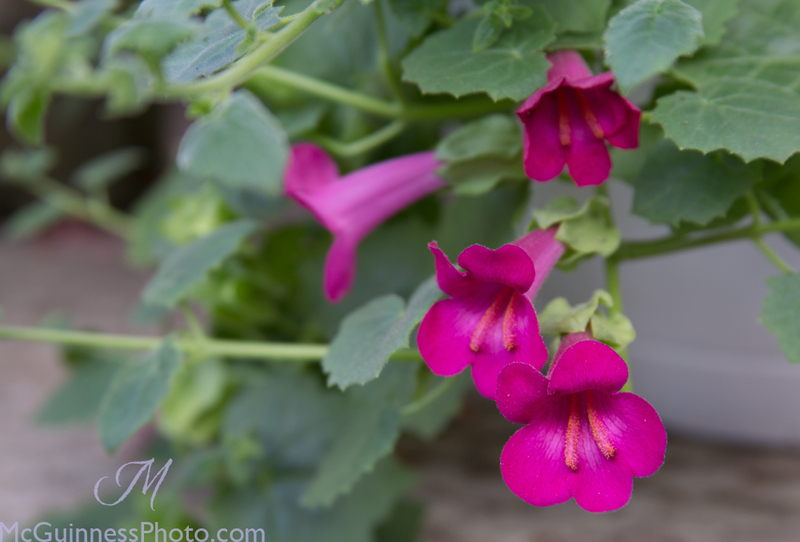 Another annual that takes full sun (to part shade) is lophospermum, which has large, trumpet-shaped blossoms. 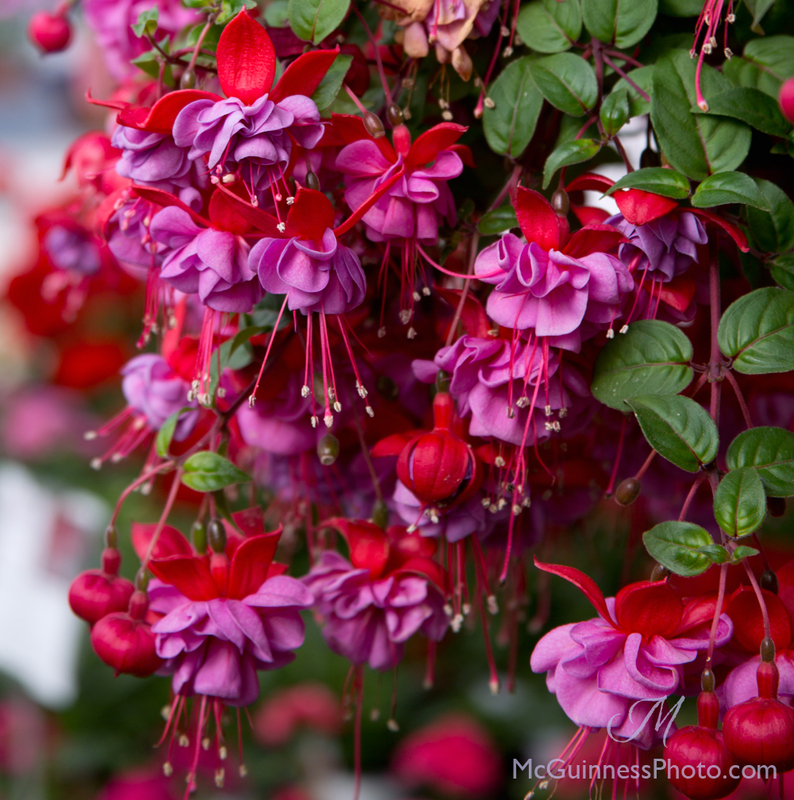 The plants, native to Mexico and Guatemala, are heat-tolerant and do well in hanging baskets. If you have a sturdy structure or trellis, Saitta said trumpet vine (campsis radicans) will absolutely attract hummingbirds. "It's a big crazy vine," she cautioned. The orange/red flowers are one of the birds' all-time favorites. "It needs a really big place to go. It takes a few years to get established and it is very similar to wisteria [in growth] but not quite as aggressive. Be sure to plan ahead and be patient - it takes a few years to get going and it won't bloom for a while." It can grow as high as 33 feet. "It is best grown on a sturdy structure to support the weight of the plant," she said. It blooms in mid-summer. Honeysuckle vine is another option if trumpet vine sounds like too much of a commitment. It comes in a variety of colors, from pale yellow to bright red. With the right conditions they can grow 6 to 20 feet tall, depending on the variety. They are fragrant and the blossoms can be used as water infusers - if the hummingbirds let you share, that is. They like moist, well-draining soil. 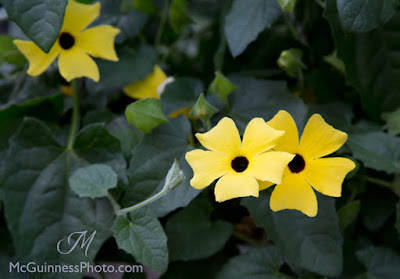 Black-Eyed Susan vine is an annual vine with yellow or orange flowers and a black throat. (There are paler shades of the plant also available.) It is commonly grown in hanging baskets and will bloom spring through fall. If you choose to grow it in the garden on a fence, be prepared for it to take off once the hot weather sets in. It can also overtake other plants, so be sure to give it some distance. (Or you can let morning glories interweave with them for a multicolored show.) They will need regular fertilizing to keep the flowers coming. "Black and Blue" salvia is also popular with hummingbirds. "I had that on my porch with mandevilla and they love it," Saitta said. Treated as an annual in the northeast, this plant can get as tall as 2.5 to 3 feet. (Taller in zones 8-10, where it is a hardy perennial.) The flowers are a deep cobalt blue with black calyces and bright, chartreuse green leaves. 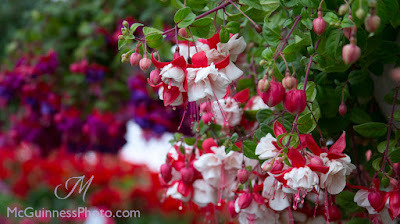 Another favorite is Cuphea (also known as the Cigar Plant). 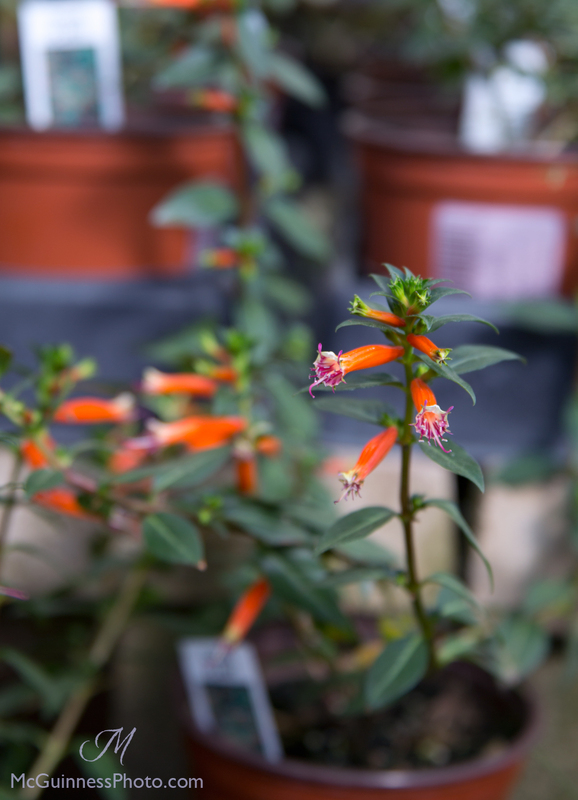 Only growing about 12 inches tall, this native plant to Central and South America attracts hummingbirds with it's small, red tubular blooms with white ends that can resemble ash-tipped cigars. It does well in containers and flowers continually all summer. Perennial lobelia, also known as cardinal flower, attracts hummingbirds with its red flowers. Paul and Sandy's offers two varieties: Fan Scarlet (24 inches tall) and Vulcan Red (24-32 inches tall). "It's a huge one that they love that blooms in midsummer to early fall," she said. The plants can be found in full sun to part shade. It's easy to keep listing plants that grow in full sun that hummingbirds love: crocosmia, monarda (bee balm), and any tubular penstemon. The flowers of these plants are typically red, with varying shades of pink to red for monarda and penstemon. Perennial salvia (purple flowers), columbine and dianthus are also options. 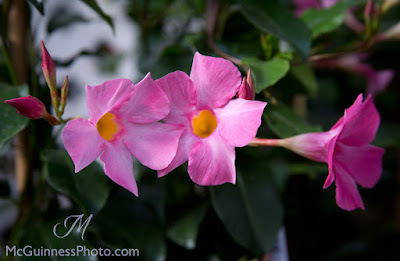 Wigelia is a blooming shrub that attracts hummingbirds in the spring with its white, red or pink flowers. Fuschias growing at Paul's & Sandy's, too, Inc.
Too much shade in the garden? No problem. You don't need full sun to attract hummingbirds. Saitta swears by fuschias to attract hummingbirds. "Customers say, 'My hummingbirds love them,'" she said. 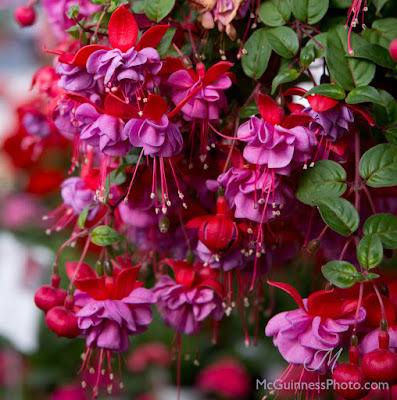 Fuschias are an annual shade plant that grows well in hanging baskets. 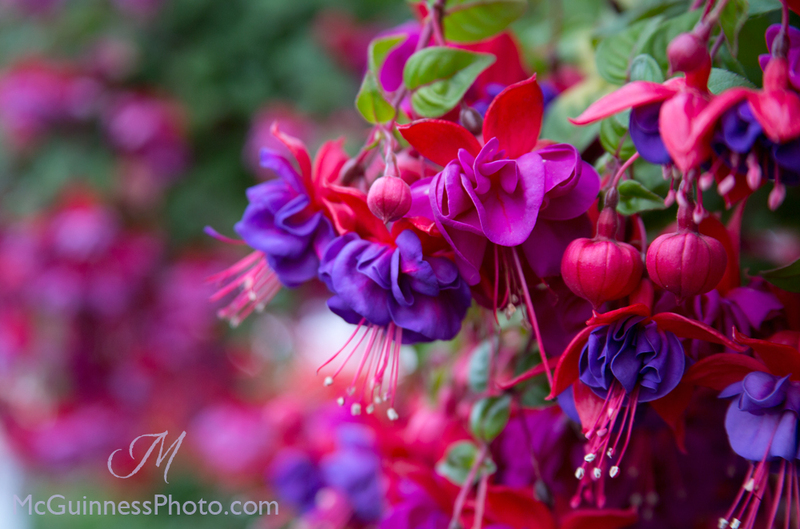 Saitta said it doesn't matter which color fuschia a gardener can choose - and there are several ranging from deep purple, magenta pink to bright red - hummingbirds are attracted to all variations due to the shape of the flower. Be prepared to fertilize this plant regularly to keep it blooming all summer long. Saitta suggested combining fuschias with perennials heuchera and hostas in a shade garden. 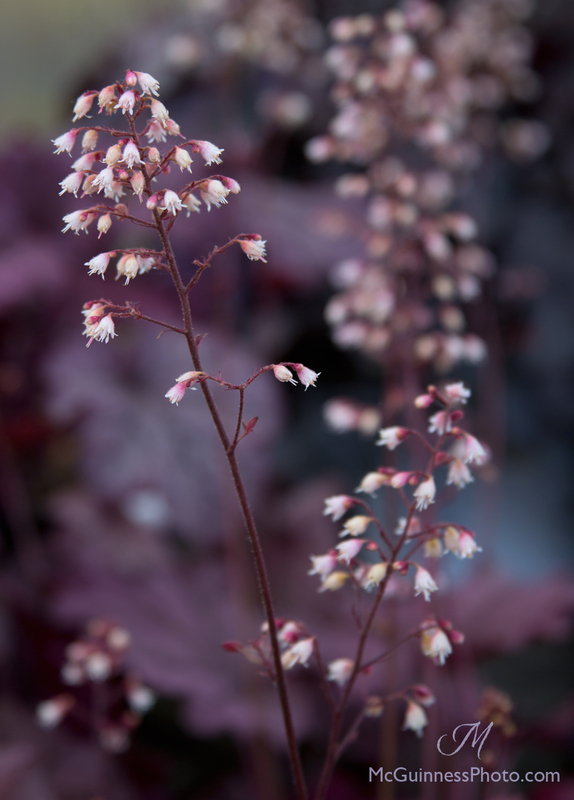 The flowers of heuchera (coral bells), bloom for a portion of the summer. "It's what they love. They like to go to that," she said. Heucheras have exploded in popularity over the last few years due to the variety in colored foliage they offer, which will continue to add garden interest after the blooms have faded. Hostas will typically bloom in mid-to-late August, but similar to heucheras, are grown mainly for their attractive foliage. Hummingbirds will visit the hosta blossoms when they bloom. "They will go to them, just not as much," she said. 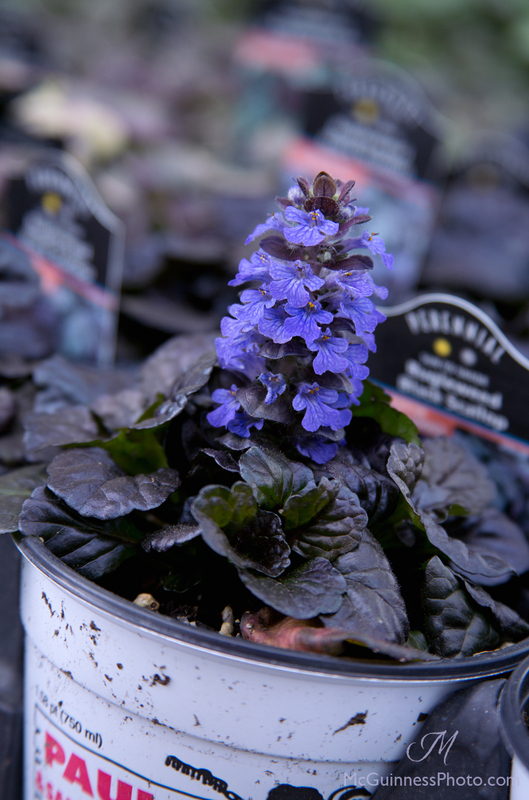 Ajuga (bugleweed), grow best in shade as a ground cover, with deep purplish black leaves and violet blue flower spikes. The most common hummingbird seen in Connecticut is the ruby-throated hummingbird. The male birds are known for their ruby-colored throat and emerald green feathers. The females are emerald green with a white breast, and are larger than the males. The bird overwinters in Mexico, Central America or the Caribbean Islands and will migrate throughout the eastern and mid-western portions of the United States. The males typically arrive first, followed by the females, according to hummingbirds.net, and will typically arrive in Connecticut in mid-to-late April. The best time to hang feeders in Connecticut is the spring. "They are looking for something to eat," Saitta said. "We recommend putting a feeder up to bring them in. Then you can supplement with plants and back off with the feeder. Be diligent about putting it out early in the spring." Hummingbirds will often return to a location that offered a feeder the year before. "Some years they come earlier. If they know you're there, they will come." They are typically attracted to the color red, which is why feeders are often colored in this way. For feeders, a 4:1 ratio water to sugar is used. Combine the water with the sugar and bring to a boil. This will help keep mold from growing in the feeder. 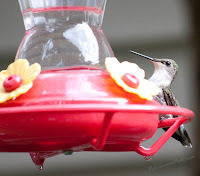 A hummingbird at a feeder. The sugar solution needs to be replaced every couple of days, sometimes once a day in very hot weather or direct sun. For gardeners who want to skip the feeder, Saitta said it's important to choose plants with different bloom times. However, she recommended supplementing blooming plants with a feeder in the fall due to migration season. "If you grow annuals, put them out to keep them around," she said.